Though many games lift portions of their design from their contemporaries and few people complain, the fact that Darksiders lifts a lot of its structure from the Zelda series suddenly makes it a federal crime. Can a game that borrows elements from many excellent games be considered excellent in its own right? For my money, the answer is yes. 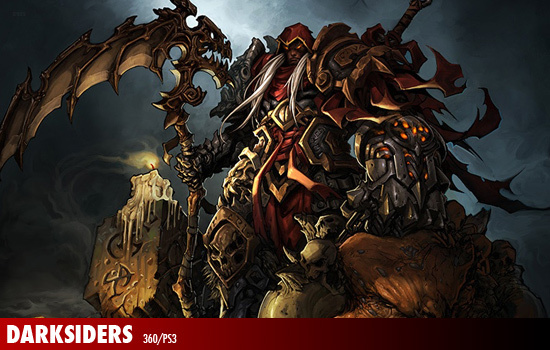 Darksiders stars War. You know, the Biblical War, who has 3 other friends with an affinity for equine travel options and end-of-the-world scenarios. Unfortunately for War, someone triggered the Apocalypse early and placed the blame on him. In an interesting twist that the Book of Revelations forgot to mention, the Horsemen, Angels and Demons all have to play along with a group called the Charred Council who seem to be the official referees of the Apocalypse. In any case, War is blamed for wiping out humanity early and must seek out bloody revenge against those who falsely accused him. Joining him on this journey is Mark Hamill as the Joker (not really). Combat is very fast-paced, similar in vein to the God of War series. War swings his blade, Chaoseater (how metal is that?) and can string together combos using it and a variety of sub-weapons. Though you can block, it seems that you're most likely to use the dodging and dashing mechanics to defend yourself. Mastering the combat is essential to success in Darksiders because the amount of damage enemies can unload onto War is fairly substantial. While you earn multiple life bars throughout the game, later enemies can hit you hard enough to lose several to a single blow. The real star of Darksiders is its dungeon design. Taking cue from the Zelda series, each dungeon contains a key item that you will need to learn to use effectively in order to proceed. Think I'm off with the Zelda comparison? You get a friggin' hookshot, and it is awesome. Puzzles range from mundane block pushing to creating explosive chains to using a Portal-inspired gun to create pathways for energy beams to travel around a level. At the end of each massive dungeon is an equally impressive boss. Darksiders really nails a sense of scale in these fights, and they're all suitably epic. With solid combat, excellent dungeons, a flaming horse, colorful art direction and epic scale, Darksiders comes highly recommended. Besides, any game that has direct homages to Panzer Dragoon, Shadow of the Colossus and Portal is OK in my book. Page created in 0.6575 seconds.